MintVine.com Reviews - Legit or Scam? MintVine.com Reviews – Legit or Scam? In order to finalize your account setup, you simply need to fill out a personal questionnaire consisting of eight questions, but which will better help you receive surveys that you will qualify for. MintVine promises that the information provided in this questionnaire will not be sold for advertising purposes. Market research is an important aspect for companies looking to increase sales by targeting their products to a specific audience and demographic, which is essentially every company that makes money through sales. Whenever you complete a survey, try a product and create a review, or complete an offer, you will be given a certain number of points. These points can eventually be converted into cash payments. You will need a minimum of 1000 points to cash out your account – 1000 points is equal to $10. It takes up to two weeks for points to post to your account after you have earned them, but members with PayPal account can withdraw money without delay after the points have been posted. MintVine members can sign up for free, which is important because companies should never charge people for the opportunity to take surveys. In addition, their payout minimum of $10 is very reasonable – many companies which pay their members cash have payouts closer to $20 or $25. Also, MintVine warns their members that while completing offers from companies does offer a high number of points, these offers can sometimes be tricky and may require a credit card number which will be charged if you do not closely follow the rules of the offer. 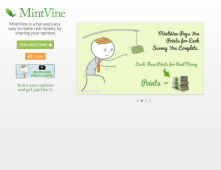 As long as MintVine.com is reliable when it comes to honoring member payouts, it seems as though they may be a fair company to work with. However, when working with any market research company you will want to keep track of all the work you do for this website, so that you can contact customer service if there is ever an issue with you receiving credit for your work. Average Rating for " MintVine.com " is 2.22 out of 5 based on 37 reviews. They started great but now no longer have a redeem button and are running over a week on paying via PayPal to the point if you Google MintVine surveys all you see are complaints. Seems to me that they're quickly turning into a scam and possibly a Phishing Site too ! I guess I'll never see the supposed $40 in my PayPal account as they just don't seem to care. This is a scam. I earned enough for a payout and tried to redeem, payout was rejected with no response anywhere from customer support as to why. $25 worth of surveys and my time for nothing. FRAUDULENT!! Like others stated lately this place is a FRAUD!! Tried redeeming and then got a rejection. Support has never replied back & now there is no redeem option, just took $25!! The his place is a scam don't ever go here!! Competed enough surveys with cleared points to get the payout. Mintvine will never pay, redeem now button does not exit. Do not waste your time you will never get rewarded. This company makes it impossible to receive any money you've earned, nothing works and every single point you earn by doing a "leading" survey you have to fight for twice as long as the survey took. Even then you are out of luck. As for the points that they used to give for survey rejection is not usually the case. You can be rejected 18 times because making even 1 rejection point. Starving children in Africa more then this company can offer you. Mintvine is AWESOME!!!! Seriously legit. Love this survey site! This recently happened to me - I answered over 30 questions and then the survey said I didn't qualify, so I went to my survey history and clicked "report issue" and selected "late disqualification" and bam. Next day got my points. Yes, you go on this never ending cycle of non-existent and non-paying surveys. After answering loads of questions for free of course! Not a get rich quick by any means but it does pay out. Took about a week but I did get paid.